The new Win10 update has put a Sound Device switcher into the Volume Control panel – is it possible to make 7TT use the new Volume Control slider instead of the Classic one? Thanks for any info! Ahh that’s a shame. There’s now no quick way to switch between input/output devices (they all take many clicks or dialogs). Awesome! That works so well! Really happy, thank you! Unfortunately, this makes the tray area incorrectly sized, which I suspect, is solely due to lack of support for such possibility by 7+TT. Is it possible to recognize possibility of reducing the distance between tray icons and, as such, correctly calculate size and position of the tray area? I tried to make it work correctly while researching for this feature, but unfortunately I wasn’t able to find a solution that works. I am getting 7+ TaskBar Tweaker: Could not load library (1003) error with v5.5 on non april update (can’t update at the moment because of corporate policy). Any way to download 5.4 again? Hello! I just created a shortcut of “7+ Taskbar Tweaker.exe”. Is it possible to launch it minimized (without showing the program interface)? Thanks. You can use the -hidewnd command line switch. But if an instance already running it starts with a window. Is there a way to not show the window if it is already running? No. You can check whether the tweaker is already running before running it again. Your help link isn’t assigned to any app to open it. seems the option to have all tray icons to display on hover is now gone in the v5.5 build . Was this intentional ? That was a fav feature of mine ! 7+ Taskbar Tweaker never had such an option. Perhaps you’re confusing it with a different program. Having a small issue. I’ve set “no width limit” on advanced options to make the taskbar as thin as possible when it’s in a vertical orientation but upon startup, the taskbar always resets to the default Windows 10 width. I’ve installed the tweaker through Standard and also made sure it starts on startup so a bit confused here. I’m running Windows 10 1803 (April Creator’s Update), so maybe that’s the issue? I’ll try to reproduce it on my computer, and will let you know if I see the issue too. Meanwhile, can you please tell whether you have more than one monitor, and whether you have other customization programs on your computer (such as a custom start menu)? Hi, thank you for getting back to me! I only have the one monitor (it’s a laptop) and I am running custom themes on Windows. Specifically the Windows Arc Dark theme as well as custom cursors and custom icons. Those are the only customizations I’m currently running. Does your taskbar look different? Can you upload a screenshot of the desktop right after the computer boots up? 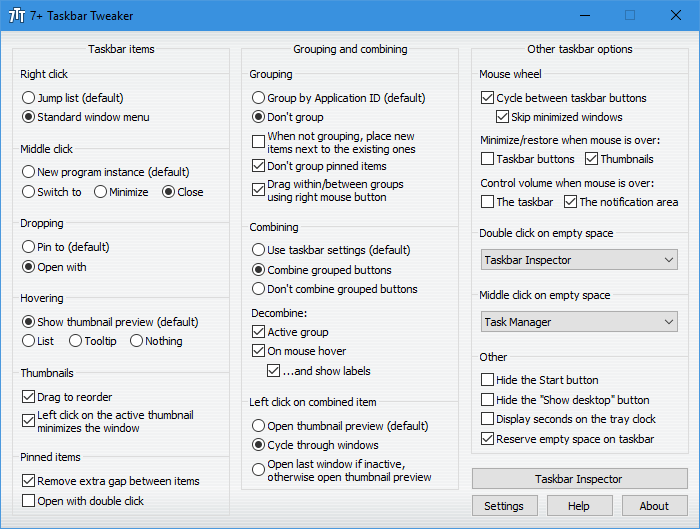 The latest version of the tweaker, v5.5, supports every available Windows version, including the latest Windows 10 April 2018 Update. 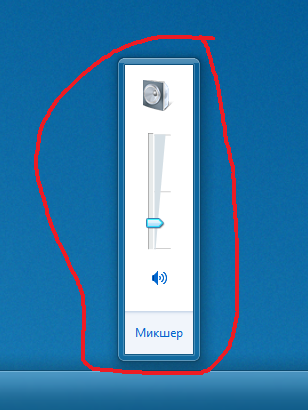 I use volume control by mouse scroll over taskbar. Can you make an option that disables volume slider popup, see picture. You can use the “sndvol_tooltip” advanced option to have a tooltip instead of the slider popup. I discovered one bug, when u do a rightclick on an item in the taskbar, the explorer crashes …. maybe u can fix it?! Are you using an insider build of Windows 10? Insider builds are not supported by the tweaker. The ability to show or hide badges on applications in the taskbar individually. Right now the Windows 10 has setting for that, but it is global, i.e. show or hide the badges for all apps in the taskbar. If you can add support in 7+TT for individually setting up the badges that will solve many problems, mainly with the user profiles icons on multi persons chrome instances – check the attached pic. You didn’t attach an image, but I understand what you mean. Request noted, but I don’t promise to look at it anytime soon. Thank you so very much, I was able to access by right clicking the main window title bar. I was not able to by the tray icon, but now I was able to set my task bar icons to bigger size which is really what I was after. I appreciate your help very much. Thanks again. What is the registry hack you use to hide the “Show Desktop” Button? There’s no such registry option. Please see the FAQ on this page. I see. Sorry for the oversight. My IT department made me remove your software since they said it had a trojan virus. I was just wondering what manually steps I could take to remove the button. Are you able to share that process with me? You can’t really, unless you’re going to program a solution that does something similar to what the tweaker does. The detection is most likely to be a false positive detection, so it may be best to ask the IT department to check it out. Loving the taskbar tweaker so far. I have a question. Is there a way for the app to remember my custom groupings (using taskbar inspector). Once I reboot, I have to set up everything again. With newest updates to window the width of my taskbar has started being inconsistent. I use 7tt mostly to shrink the size of my taskbar on the right hand side of my screen. I have 1 monitor, but also sometimes connect my TV. Connecting TV is a sure way for the taskbar to mess up when it gets unplugged. Issues vary: Growing by a few pixels, reverting to windows default size, growing to max size. Fixing it: Unlock taskbar, resize, lock taskbar. Is there a way to add “remember width”? Or something similar? When you resize the taskbar to have smaller width than possible by default, the width is saved. Next time the tweaker starts, if the taskbar width equals to the default minimum, and if a smaller value is saved, the smaller value is applied. ). Could it be that my system version is just too new currently? The beta version also didn’t work. 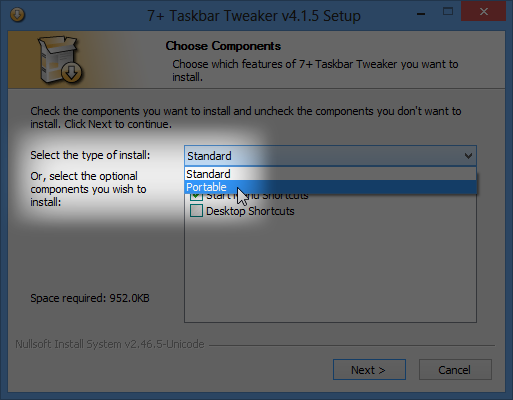 Insider builds are not supported by 7+ Taskbar Tweaker. I may consider implementing partial support for the latest insider build if I find the time for it. I’m not familiar with this problem. Are you sure that it’s caused by the tweaker? The tweaker shouldn’t affect the desktop. If the issue is not solved after a restart, and you see that it appears only when the tweaker is running, try to find a way for me to reproduce the issue. Can you add an option to extend icon size to 48×48 ? You already have the option w10_large_icons that allow to get 32×32 icons on windows 10. I tried to do it once, but unfortunately doing it is much more difficult than 32×32, since the size of the taskbar has to be increased too. Is it possible to download previous versions of this program? I would really like to download version 5.2.1 if possible (I’m on Windows 10 Build 14393), and currently the latest version of 7+ Taskbar Tweaker (5.5) does not allow me to use middle click to close all instances of a program on the taskbar in some cases (for example, if I have multiple file explorer windows open and use middle click to close it, nothing happens; however, if only one instance of file explorer is open, it does close). I’m not 100% confident that an older version would fix this problem, but I’d at least like to try. Hopefully you can point me in the right direciton. Sorry for the misunderstanding; I should have explicitly stated that what I observed above is a bug; when I use the configuration that you mentioned, in the newer versions of 7+ Taskbar tweaker, a bug occurs in which the windows don’t always close; however, in the older version that I mentioned, this bug is not present (specifically in Windows 10 Build 14393). Since this bug is only for older builds of Windows 10 (not newer ones), it makes sense why you haven’t encountered it. That’s why I wanted to know if there was a way to download older versions of the program. If you can tell me which version introduces the issue, and how to reproduce it, I’ll try to see what’s going on. how to disable left click on an item to open it, pls? ah, I found it, choose “Open with double click in Pin items”. Ths. no_width_limit is not working for me, what should I do? What do you mean by “not working”? Enabling it does nothing at all? Do other versions of the tweaker work? It works for me, so I need a way to reproduce it. Yeah, enabling it does nothing. I don’t think other versions will work, because my build is build 17134. I first installed the non-beta version, no width limit didn’t work, then I installed (without unistall the previous) the beta version, updated, opened, tried again: didn’t work. Do other options of the tweaker work properly? Also, do you have any other system modification tools, such as a custom start menu? Do you have something unusual, such as a non-standard theme? Yes, they do. Like removing transparencity, or removing the Windows button. I do have “Classic Start Menu”. No, I don’t use themes or something like that. By “Classic Start Menu” do you mean Classic Shell? That’s a candidate for an incompatibility. Can you try disabling it temporarily, restarting (or signing out and in again), and checking whether the option works without Classic Shell running? Also, just to make sure you understand what the option does: the option allows to resize a vertical taskbar to be narrow, beyond what Windows allows by default. So enabling it does nothing by itself – after enabling the option, you need to unlock the taskbar, and resize it to be as narrow as you wish. See this link for more details. Question: When I change the Application ID of a taskbar button in Taskbar Inspector, is it possible to have it always remember (or save) what Application ID I set that taskbar button to, even after closing that window? For example, I want Photoshop and Illustrator to always be grouped in the taskbar. I can manually group them every time I open them but I’d rather they grouped together automatically. I’d like File Explorer and Control Panel to automatically group together as well. This actually brings up an issue with grouping anything with Control Panel or File Explorer; like if I wanted to group File Explorer and Word. If you go to a different page within either while they are grouped with another taskbar button, its taskbar button will leave the group (that is only if is grouped with other taskbar buttons, like Word). I’m pretty sure this is because, as you navigate folders/pages within File Explorer or Control Panel, its name changes on the taskbar, and so it’s seen as a new taskbar button. This doesn’t happen with any other programs where it’s taskbar name changes however (like chrome) so idk that this is the real culprit, it’s just what I’ve noticed. So unless that can be fixed, I imagine an alternative way to auto-group would be, instead of remembering to move taskbar buttons into specified groups, to remember to merge taskbar buttons under specified Application ID’s together. For the above example the two ID’s are “Microsoft.Windows.Explorer” and “Microsoft.Windows.ControlPanel”; so taskbar buttons under those Application ID’s would always be merged into a single group. It may cause problems with pinned taskbar buttons (like if Explorer is pinned and Control panel is not, and Control Panel had been opened first, making it so when File Explorer is opened they aren’t grouped at the pinned position), so I guess pinned buttons would need to take priority as to what the host “merged” group Application ID is. is it possible to have it always remember (or save) what Application ID I set that taskbar button to, even after closing that window? Once you do that, two shortcuts with the same AppID will group. That’s the behavior of explorer, and it’s not common – I didn’t see other programs changing their AppID so often. The tweaker has a partial solution for this – if the folder’s AppID is changed to a random id (random_group_xxxxxxxx), it won’t change anymore, even if you go to a different folder. Also, check out the Drag within/between groups using right mouse button option. It allows to manage groups much faster than doing that with Taskbar Inspector. For example, if you want to assign a random AppID to a folder, you just need to drag it out of the taskbar with the right mouse button. 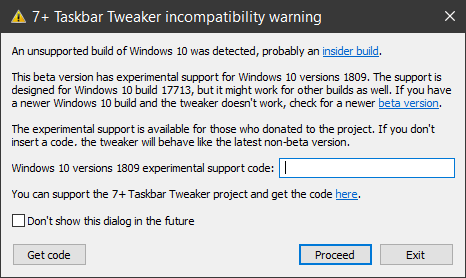 I’m having a problem in build 17713 RS5 (I’m using the Tweaker v5.5.0.4). 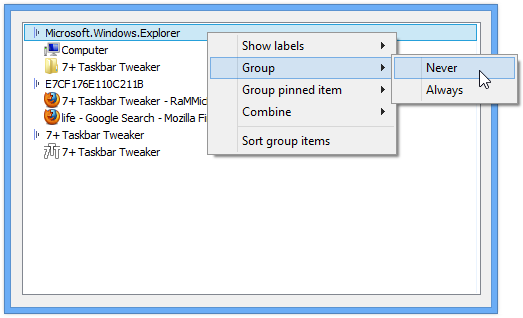 When using the advanced option of drag_towards_desktop (option 9 – Close all group items) the explorer crashes instead of closing the group. Again, thank you so very much!! This is one of those programs that I can’t live without! You rock RaMMicHaeL!!! Thank you for letting me know. Build 17713 is an insider build, and as I mentioned in the recent blog post, minor issues are not high priority to fix for insider builds. I may look at it when I have some spare time, but I don’t promise. I used AutoHotkey and TaskbarNavigation script with Windows XP to switch between windows in taskbar order. But now I use Windows 10 and that doesn’t work here. So I try to use you program 7+ Taskbar Tweaker. Alt+Tab to open next window in taskbar. doesn’t work, because starts native Windows 10 switch between windows. INSTEAD native Windows 10 swith between windows? When Playing, the taskbar button has a green progrees bar in background. I’m using RTL system, and the progress goes RTL instead of LTR. Is there a way for developers to control and filp the progress direction? Hi, I don’t think there’s an API for that. I haven’t had the chance to use the feature myself, but it looks like you can only control the percentage and the state (see here). I’d just like to say this program is probably one of the most highly useful utilities I’ve ever used. It makes all the changes seen in Windows since 7 onwards actually helpful. Without it, the direction Microsoft has taken the Windows desktop isn’t very user friendly. Some features are good but not in their default form and generally speaking MS has gone down the less-tweakable route so the features could be so much more useful … and are, with utilities like this one. It’s rare but is does happen: you’ve made software that should truly embarrass Microsoft by improving one of their “cash cow” products by a very large factor. Thank you for your hard work. It absolutely makes my daily life that much easier and that’s no small task, I can tell you! No clue if it’s possible with the app, but I would love if this could allow for reordering the right click menu on taskbar items. Specifically, I want the pinned items to be at the bottom of the list so they are closer to the cursor. Using chrome for an example – if you right click it opens a menu with grouped list of (from top to bottom) pinned, most visited, recently closed, tasks. I love this software so much! Thank Ram Michael for this awesome soft! I just made a donate with a small amount. Hope I can help something! Window focus is wrong when using middle click to close a program, if the program pops up a dialog to confirm exit, it would be hidden behind the main window making it impossible to interactive with. For example, mmc programs (eg: Windows Firewall with Advanced Security) would ask user to close all dialog boxes before close the main program. If I have some property window open and try to exit it by right click on the taskbar button and choose exit, I’ll get the dialog asking me to close all dialog boxes first, no problem here. However if I use middle click to close it, as soon as the dialog appears, the main window is focused, thus hiding the dialog below it. As the dialog blocks input to main window and the main window hides the dialog below it, the program is impossible to interactive with. The only way to gain back control is to open/switch to another program, then minimize it (which returns focus to previous window, in this case the mmc window) now the exit dialog would appear on top of the main window and can be interactive with. This problem is not limited to mmc programs, other programs with the same behavior (pop up dialog when exiting) would also trigger this. FYI, I’m using Windows 7 SP1 x64. I can reproduce the issue with mmc programs. This is indeed tricky, but I believe that it’s the mmc programs focusing implementation to blame. You can also see other issues with it. For example, after the program pops up a dialog to confirm exit, click on its taskbar button. It will hide the pop up dialog, which leads to the same issue. 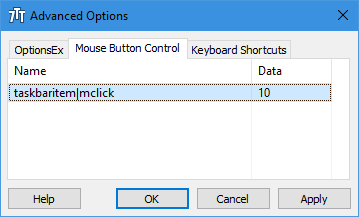 The reason you see the issue with middle clicking but not with right clicking is that when you right click and choose exit, Windows brings the window to front before closing it. I wanted to avoid the unnecessary flashing with the tweaker, so I’ve implemented it differently – the tweaker brings the window to front only if it doesn’t close after a timeout, which probably means that there’s a closing notification. This problem is not limited to mmc programs, other programs with the same behavior (pop up dialog when exiting) would also trigger this. There is this browser I use to play a web game, it’s in Japanese. You don’t need to play the game or read Japanese, basically it has a pop up window just like the mmc. The good thing is that the dialog has a task bar button so I can switch to it easily. The later release of this program contains cef which makes the program really large, if you want to see it in action yourself, you can download an older release (3.1.2 and earlier) which is really small (about 1MB) The program is in Japanese but you don’t necessary need to understand it, by default it will have this dialog when you try to exit. Thank you for the detailed description. I understand the scenario, no need to download the program. I’d say that in this case, too, the design is flawed – if the message box is designed to block the main window, it should be its child window, like it’s usually done. In any case, I understand that not all programs are ideal. I can fix it by bringing the closed window to the foreground before closing it, like Windows does it. But since the flawed behavior is not common, and since it will introduce unnecessary flashing on closing, I prefer to leave the current behavior. I used version 5.4 and it was working fine. I upgraded from 32-bit MS Office 365 to the 64-bit version. The icons on the taskbar for Word/Excel/Skype changed to a white sheet of paper. I upgraded to 7TT version 5.5 hoping it would fix that, but now 7TT will not load. The 7TT icon shows up on the system tray, but when I mouse over it, it disappears. I uninstalled 5.5 and reinstalled 5.4, but still does the same thing. Is there a way to fix this or should I try a system restore? I got the taskbar icon issue fixed. I just had to right click each program that had this issue and choose to open a new occurrence of it. Then a dialog box would open and say there is a problem with the shortcut and asks if I want to delete the shortcut. Once the shortcut is deleted, I shut down the program (word/excel/skype). When I reopen them, the icon on the taskbar shows correctly. Now I just need to figure out how to get 7TT working again. Hope you have some suggestions for that. I got 7TT v5.4 working again. Unchecking the run-after-install box, and then running manually when install was 100% done, allowed it to come up without issue. Still can’t get 5.5 to work, but maybe that is because I’m still on Win10 Build 15063. Windows 10 Creators Update (build 15063) is supported since version 5.3, so both v5.4 and v5.5 should work. The 7TT icon shows up on the system tray, but when I mouse over it, it disappears. Sounds like the process is being killed. Perhaps your antivirus kills the tweaker for some reason? Please try disabling your antivirus temporarily, or adding the tweaker to the antivirus’ whitelist, and see if that helps. Looks similar to this report. Can you post a screenshot like I asked in the comments in that link? Nach Eingabe des Spender Code lauft 7+ tadellos. When switching to a second screen (tv) I also have it set up to increase the ‘change the size of text, apps and other items’ setting (using a program called Monitor Profile Switcher), because I’m sitting farther away. Problem is this will also increase the taskbar icon size, and thus the taskbar, which will alter the last_taskbar_width value, so when switching back it uses that value. Might there be a way to fix or work around this? myWS.RegWrite "HKEY_CURRENT_USER\Software\7 Taskbar Tweaker\last_taskbar_width", 1234, "REG_DWORD"
Create a .vbs file with the above code (replace “1234” with the last_taskbar_width value on your computer) and place it in the startup folder. Using the latest beta with release 1809 and i can’t rearrange taskbar icons. The icons freeze when i try to do this when virtual desktop order fix is enabled. Do you have an ETA for 1809 support? No ETA for now. I’ll look at the virtual desktop order fix issue when I have the time, thanks for reporting. Please consider doing a fundraiser like you did a few versions ago. But really, this should be paid software. It’s crazy that you give it away for free as it’s such an essential program for so many people. You could be making a good income from this plugin! Thank you for the feedback Martin. While doing fundraisers in the past, I got mixed feedback, some of it negative. You still can donate to the project (I know you did – thanks, but the comment can be relevant to any 7+ Taskbar Tweaker user reading the comments). Your donations are still as helping, encouraging and motivating as they are with a scrollbar and a target amount 🙂 and you can always specify that your donation is for the new Windows 10 update support in the Recognition Wall comments. Any time the subject of money comes up there will always be people saying negative things. So I wouldn’t worry too much about them. From what i remember, your last fundraiser went quite well. So please ignore the haters. As a developer you deserve to be paid. Like I said, this is essential software for many people, and you put in the time and effort to get it working with each new windows version. So why shouldn’t you be compensated? Have you ever consider selling this as a product? Many things like this are often sold for a set price and includes 1 year of updates. After that, you have to buy it again. The reason why i think this is a good approach is because by supporting the developer you support the product. And if it’s a good product, as this is, you want to ensure it continues on and is updated when needed. So from a purely selfish point of view, i think if this was paid software you would already have this fully working with the new 1809 update. But as you do this in your spare time, you work on it when you can. Which is fair enough and completely understandable. The virtual_desktop_order_fix advanced option should be fixed in v5.5.0.5, please try it out and let me know if there are any other issues. I’ve tested this update out and all appears to be working as before. Great job! thanks! I got error 5 message on app startup (october update 1809 – non insider). Guess I’ll try again later. Thanks for the contribution! The problem should be fixed now. Is it possible to add TMT to 7+TT? Any news about an alpha for the October 2018 Windows 10 update? Including a paid version? The Windows 10 October 2018 Update is not yet supported. You can try the beta version of 7+ Taskbar Tweaker which has partial support for the new update, based on an earlier insider version. According to the users’ reports, the beta version works, but has several issues. I’ll look at it as soon as I have some free time. hello RaMMicHaeL, thanks for reply, but this is the message i get even with the beta version. Are you sure that that you’re running the beta version of the tweaker? The beta version should display a different incompatibility warning, that is unless you’re running a 19H1 (version 1903) insider build of Windows 10.
hi RaMMicHaeL, actually when i installed v5.5 then i took that screenshot and when i installed beta version it was also not working. now i attached the screenshots of beta version which gives 3 error or warning messages. Have you used a support code? no i have not used support code yet. As the message says, if you don’t insert a support code, the tweaker doesn’t enable the experimental support. That’s why you get the error. Anxiously awaiting W10 1809 support, please ping me once this is available! Thanks and love your tool! It was already suggested, please see this topic and my answer on UserEcho. Sadly I can confirm crashing explorer after installing 5.5.0.5 and earlier. You need to insert a support code for the tweaker to enable the experimental support. Please see this post for more details. Donated again. Had to delete completely and it popped with window to insert the code. Thank you very much!! Do you think it’d be possible to add centered taskbar icons to the tool? It might be possible, but I haven’t investigated it. I might look at it some day in the future. Doesn’t surprise me that others want it too. It’d be such a nice feature to have and so far I haven’t found any currently working programs to do this in Win10 either so it’d be a huge pro to this tool. I hope you look into it sometime if you can because it’d so useful to have! Create an empty folder anywhere. Put this folder as new toolbar on the taskbar and remove text label. Unlock taskbar and move new toolbar in front of your icons. Move icons freely by handle. I wouldn’t say that’s an alternative since it doesn’t stay horizontally aligned when you open/close apps. And I don’t think anyone would want to constantly resize the toolbar to compensate for that. Yes, but when you have some apps pinned it doesn’t matter anymore to have it perfectly in the middle. Since there isn’t any other solution for now I thought it would be helpful until perfect solution comes. I use it since win 7 came out and really like it. You said that most Windows builds break 7tt, and I can understand why that happens. Does it also happen that running a new version of 7tt on an old build of Windows 10 does not work properly either? If that’s the case, then can you provide a different version of 7tt for previous windows builds as well? I installed the oldest version of windows I had, and “disable_topmost 2” does not work properly (the start menu covers the taskbar, which is not desired). No, as long as you’re running a non-insider build of Windows 10. In any case, you can get older versions of 7+ Taskbar Tweaker here and check whether older versions work differently.